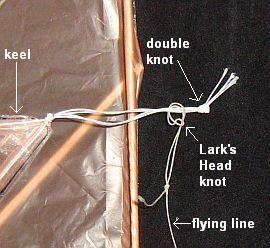 There are knot tying instructions here for any stage during the construction of an MBK kite. You can make do with just a few simple knots to begin with, but eventually you will discover the convenience and satisfaction of using all the 'right' ones! 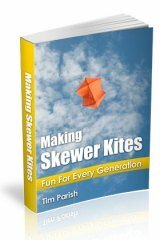 The bigger the kite, the more important it is to use the right knots. Often this relates to strength, since safety margins can be slimmer with bigger, stronger-pulling kites. All of these knots have been used in the MBK kites, particularly the larger Dowel designs. There's a separate page for each knot, or class of knot, since I have added a few comments on their usage. 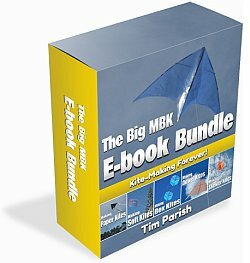 Talking about usage, our MBK kites have logged quite a few hours over the years! These instructions have been long over-due. 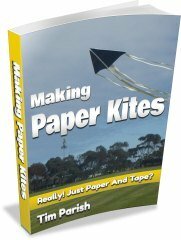 I used to get comments like 'The kite-making instructions are great, but I have trouble with the knots...'. Hopefully, my approach of using multiple close-up photos in each knot tying illustration has made them easy to follow. There's no completely standard naming system for knots. However, I hope the names used here prove to be both simple and descriptive! I hope you found these knot tying instructions useful. The Simple Knot, and its multi-strand variants is so simple that it is impossible to know for sure when it was first done, by whom or for what purpose! Agree? Heck, a chimp could do one eventually, by fiddling around with a short length of rope. The Granny is not a safe way to attach 2 ropes together, for example. 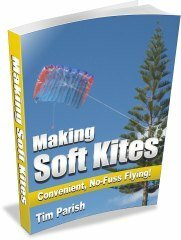 However, it does have its uses in kiting, and you can always apply a small drop of glue to fix such a knot permanently. By the way, this is also a very old knot, with some examples in museums which are thousands of years old. It goes back a lot further than grannies in the 1940s or 50s! The Loop Knot and its variations seem to have a nautical origin. Various kinds of loop knots come from European countries like Spain and France, both of which once had great numbers of sailing ships on the sea. For military, trade and fishing purposes. Even ancient Egyptian ships have been found with intact loop knots in the rigging. These were quite similar to the modern Bowline loop knot! The Lark's Head Knot is also known as the Cow Hitch, not to mention about a dozen other names! This knot first appeared in manuscripts in the 1st Century, and has been used extensively on land and sea ever since. I find it's a bit tricky to undo a Lark's Head when it's used on 20 pound Dacron line, but this gets much easier as the line weight goes up. A piece of cake with 200 pound Dacron! The Prusik Knot is definitely a climber's knot, since it can be traced back to it's Austrian inventor and keen mountaineer, Dr. Karl Prusik. That was back in 1931. Dr. Prusik also authored a book of knot tying instructions for mountaineering. I use this knot extensively in the bridles of most of my kites, both Skewer and Dowel. 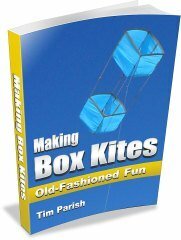 No set of knot tying instructions for kites would be complete without it. Unlock, shift it along a bit, lock it again - works great! 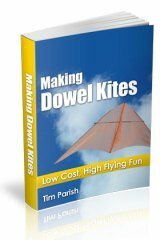 That's our Dowel Rokkaku kite below, with it's 4-point bridle. Getting it all secured and adjusted requires 4 Double Wrap Slip knots, 3 Prusik knots and a Loop knot. Plus a Loop knot on the flying line to Lark's Head knot it to the bridle!